Kinder Morgan panelist discusses the company's pipeline proposal project. Photos by Robin Grant. Kinder Morgan representatives got a frosty welcome from Burnaby residents on Wednesday when over two hundred people packed the pews of the St. Timothy Angelican Church to listen and ask questions to a town hall panel about the proposed Trans Mountain pipeline expansion. The $5 billion expansion would almost double the capacity of an existing oil pipeline stretching from Edmonton to Burnaby to 850,000 barrels per day from 300,000. If approved on schedule, the pipeline would be operational by 2017, the same year that Alberta energy giant Enbridge Inc.'s proposed Northern Gateway pipeline connecting Alberta tar sands to the BC coast would also be complete. The Northern Gateway is also currently under review for public and government approval. Questions from the audience were mostly directed at Kinder Morgan Canada's director of engineering Michael Davies. Davies attempted to assure residents a new pipeline would benefit the city. He also said the company has the emergency response to protect the environment from a dangerous oil spill. "This my backyard when it comes to what I see as a waste of time, money, and tax dollars spent. I think we need to hold Kinder Morgan accountable for the fact that they are spending both our time and money, our taxes, on a project that's been put to shame and waste ... we don't want you," said David Glomb, an impassioned west Burnaby resident. It was met with a round of applause. "If and when this goes through, if there's a spill, whose job is it to clean it up? 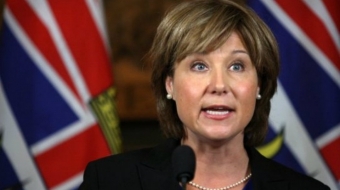 And does Kinder Morgan already have some sort of fund committed to clean up the spill? And also with businesses like Chevron shipping out jobs to India, and other foreign countries, who's going to notify us if there is an ecological disaster?" asked another Burnaby resident. 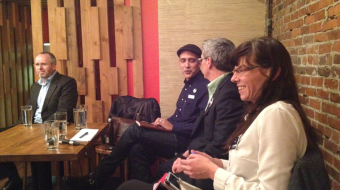 The other panelists were: NDP MP Kennedy Stewart for Burnaby-Douglas, Mayor Derek Corrigan, Carlene Thomas from the Tsleil-Waututh Nation. Ray Lord and Paul Grey were the two representatives from Chevron Corp.'s Burnaby refinery. Stewart said he is skeptical of the project, especially in light of the budget bill, which will allow big projects like this to speed through the National Energy Board approval processes. The NDP charged him with coming up with a national position on the project. His research found that 75 per cent of households said: "No way, we don't want this." "If there is great cost, and no benefit, then I don't think we should support it," Stewart said. Mayor Corrigan and Carlene Thomas were ardent critics of the pipeline project. Mayor Corrigan said he is appalled that Canada has no national energy plan that regulates and monitors resource projects like the Kinder Morgan pipeline proposal. "There is no cohesive way in which our Federal government has looked at the issue that cause these projects to be built," Corrigan said. "Without that kind of a plan, it is difficult for anyone, in any community, to be able to make the sacrifices that (the company) is asking us to make in order to make this pipeline go through." Carlene Thomas, a teacher and public speaker with the Tsleil-Waututh Nation, said the First Nations people living around the Burrard Inlet have a "right and obligation" to protect the territory from this kind of development. She said they have seen the devastation an oil spill can cause up-close in 2007 when 240,000 litres of crude oil spilled into the water. "We had our own people in the boats transporting other people who were concerned about the wildlife. We were chasing down the geese, the loons, trying to capture them so they could be taken care of," said Thomas, fighting back tears. 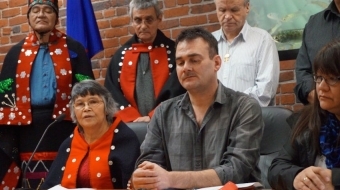 "The Tsleil-Waututh Nation opposes the expansion of the pipelines and tanker traffic. The risks are just too great to accept." When asked what Kinder Morgan had planned to convince Vancouver residents the pipeline should be built, Lexa Hobenshield, Manager of External Relations at Kinder Morgan, said the company has "an excellent pipeline safety record," and added that tanker traffic won't be an issue. "There's lots of work that's done to ensure that the vessels that use our facility do so safely."